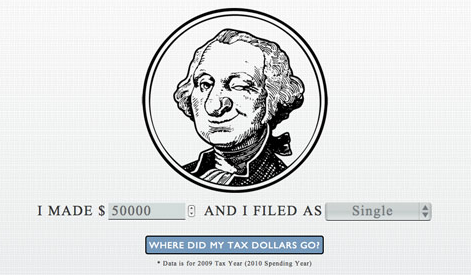 User Experience Design: Where did my tax dollars go? "Every year, Americans fill out income tax forms and make a payment to the IRS. It’s an important civic duty, but it is also a lot of money. Where does it all go? Using data provided by WhatWePayFor.com, we challenged artists, coders, and the general public to create data visualizations that would make it easier for U.S. citizens to understand how the government spends our tax money."